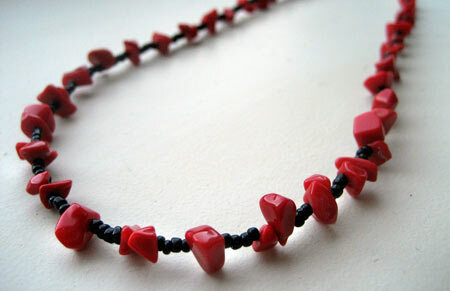 As a thank you for reading my blog, I’d like to give away this necklace I made. I’ll draw a name at random on Monday February 18th and contact the winner by email for an address. Of course, this contest is for both the ladies and the gentlemen out there. By the way, if you read blogs in an aggregator like Google Reader, I’d be so happy if you would subscribe to my blog! I’m in. My SO would love that. Anyone have some good suggestions for dinner? We hate going out for V-day, so we always make it a point to cook in that night. I’m debating between going with one of my standard good dishes (pork tenderloin with mushroom gravy, for example), or going for fun ethnic (like Cuban). lovely! what has been making me happy lately… my new pet beta fish, snow, valentine’s day scheming, and cat stevens. Kaszeta: The most romantic dinner I’ve eaten recently was made by my boyfriend – it was a pork chop stuffed with thin slices of apple and pear. I think he improvised the recipe. A chocolate fondue would be fun too! Mmm…chocolate dipped strawberries. I’ve never cooked Cuban food, but I’d like to try! What makes me happy lately?! Hmmmm……coffee and donuts in the A. M., Sunshine!, and my dog wagging his tail and running and jumping and happy to see me. There is something very fruity-looking about that necklace. Hey, I will enter too! I started reading your blog, via Bloglines, after joining your RI Food group on Flickr. Also, I too am from north jersey, spend a lot of time in RI and frequently consider moving there fulltime. Kaszeta: my bf and my Valentine’s custom is lobster, specifically Jasper White’s pan roasted lobster because it’s fancy, but fast. As long as one of you is OK with, uh, putting the lobsters to sleep. Today, I was made happy by my sister (who works here at the same place I do) who was the only person who came by at lunchtime to help me make cards to donate to cardsforheroes.org. Everyone else was too busy but her. But she came through! Things that are making me happy now: finally feeling better after a rather terrible January; planning trips to Yosemite, Tahoe, and upstate NYC; starting work on my next big fire/metal art project. What is making you happy now? Mrrrl4Real makes me happy when he snuggles in bed between M and I in the mornings, purring, with his little head poking out of the blankets. And then he pisses me off by meowing to get fed. So does my boyfriend and my new job. Great food and drink too. that’s a great necklace – hope your v-day was fantastic! I’m happy about having spent the evening drinking beer and eating tamales at one of my favorite bars. I’m not so happy about having to wake up at 6 to catch my ride to LA, but hey – the sacrifices I make for moped rallies! Stephanie: I ended up doing something similar to your bf’s recipe: pear-stuff pork chops with a pear-cumin reduction sauce and horseradish gnochhi. Worked quite well. Ooh – that sounds great! what a lovely necklace, how could i not be in for it? i am trying to write my first big article for the magazine i started to work for two weeks ago, and i lack motivation. which is how i came here. also, thinking of what makes me happy lately. which is not too difficult to tell. as ist turns out to be someone i met, the new job, and spring waiting readily at the door.